At our Sheet Metal Shop you will always receive fast, quality installation with our in-house state-of-the-art fabrication equipment. We offer full fabrication capability, with expert craftsmen on staff to provide custom products and services. Fabrication services take you from engineering and design to a completed and installed finished product. 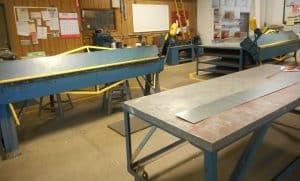 All sheet metal fabrication is completed on-site in our own sheet metal shop. We can customize just about anything so you will be able to get a quality product every time. We design, manufacture, and install duct work for heating, ventilation, and air conditioning units. We will always work to go beyond your expectations when serving you.